Devotions based on Phil 4:13 "I can do all things through Christ who strengthens me" were given. The meeting opened with reading of the LWML Pledge. The minutes of the last meeting were read. The treasurer's report for Dec was corrected to read a balance of $373.88. It was reported that $220 was collected to purchase gas cards in the amount of $10 each to benefit the Parkville Women's Clinic. The LWML Spring Zone Rally will be held on March 30 at Mount Calvary Lutheran Church, Excelsior Springs. Easter Sunday is April 21. A sign—up sheet for the Easter breakfast will be used. Recommendations for year—end donations will be presented at the April meeting. A motion was made and seconded to send a large box of treats to our college students in the fall. The congregation will be invited to participate. A smaller box of treats, provided by the Guild, will be sent to our college students in the spring. The meeting closed with devotions given by Pastor Reiser. The Ladies Evening Guild met after worship on October 7, 2018. A reference was made to thank you notes received from Concordia Fort Wayne, Concordia St. Louis, and Pastors Naumann and Johnson for the donations made to them in the spring. Motion carried that the previous minutes be approved as written. Corrections were made to the Member Roster in the yearbook. The treasurer reported a working balance of $65.88. An offer was made to order the flowers for All Saints Day (November 4) and a request to have them picked them up. A note will be put in the bulletin. Suggestions for a Christmas ingathering will be gathered, and a note will be put in the bulletin on November 4, 11 and 18 with the collection box out November 11, 18 and 25. Motion carried to approve the bylaws as amended. We were reminded that we are ordering only 4 Quarterlies which are kept on the table by the kitchen to be read and then returned for others to read. The KC North Zone rally will be held at Faith, Richmond on Saturday, October 27 with registration at 9:30. The program and ingathering have yet to be announced. Let the guild president know if you are interested in going. The Kansas City North Zone spring board meeting was held at King of Kings on March 11, 2017. Since August 1998, $14,254.35 in mites have been from the sale of stamps. Currently there are 3 buyers for the stamps. Two members of Holy Cross Lutheran Chruch donated their grandfather’s stamp collection. A thank you note will be sent. Anything but bulk and metered stamps are accepted. Since 2003, over $29,000 has been collected for mites from the collection of aluminum at Holy Cross. National LWML is proposing a massive restructuring to result in a smaller board for more efficiency. Committee members would not be allowed to vote at District board meetings but could at conventions. New rules for submitting district grant proposals are on the web site. Proposals for the 2018 convention are due October 31. Our Zone President appointed the Nominating Committee. Only Christian Life cannot serve another term. Secretary and Treasurer are eligible for another term. The Zone spring rally will be held April 1 at King of Kings. The district guest will be Donna Lacey. The theme of the rally is WHAT IS OUR MISSION IN THE CITY? The speaker is Pastor Zirkel from LUMA. Ingathering is non-perishable food items (pull tabs on cans, no glass). The building on Mercier is going up for sale. It was voted to retain the offering in the zone treasury to help cover convention expenses. Pastor Gier encouraged us to attend the Luther Movie on May 11 at 7:30. There is a link on the church’s web site or at TUGG EVENTS/MOVIES for purchasing tickets ($12). Pastor Scharff will give a 5 minutes introduction and there will be a 30-minute Q&A period after the movie. On October 15, a 500th Reformation anniversary event (hymn fest) is planned for the Kauffman Center. The fall board meeting will be at 8:30 a.m. at Trinity on Saturday, November 4 followed immediately by the rally at 10 a.m. Pastor Geier recommended that the fall rally program have something to do with Katie Luther. The Ladies Evening Guild sold "The Word's Best" dish cloths during the months of November and December, 2016 to support the Concordia St. Louis and Fort Wayne Seminary food banks. The dish cloths were purchased from Trenton Mills in Trenton, Tennessee. A total of 20 dozen dish cloths were sold for $2, and the food banks each received $366. The project was well received by the congreagation. The Guild thanks the congregation for their support of this and other projects such as the Easter breakfast and love packages for our college students away from home. 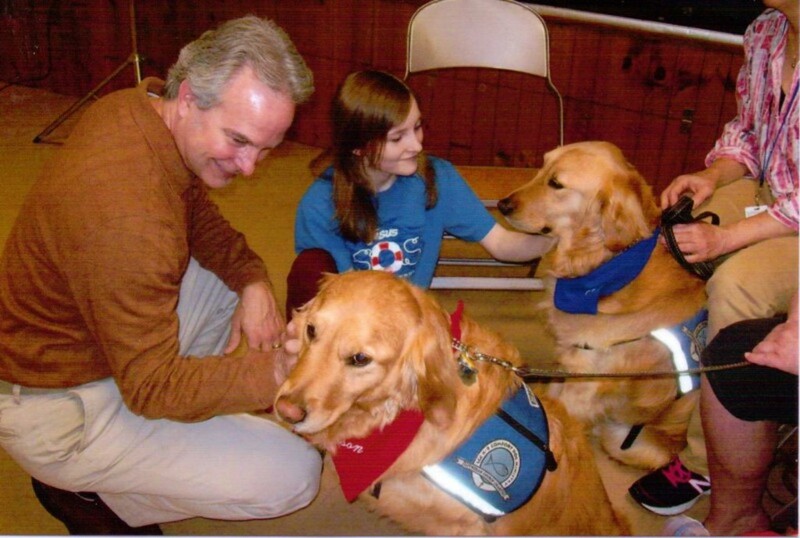 Lutheran Church Charities comfort dogs at the present time. The dogs have “handlers” with different responsibilities. One family is the home family, responsible for the total care of the dog. Other handlers travel with the dogs to areas affected by tornadoes, earthquakes, school shootings, death of a child, etc. to bring compassion and mercy to those affected by the situation while the handlers deliver the gospel message and the hope that only Jesus can give. The dogs spend their days at school where they welcome children to school in the morning, visit classrooms, listen to children read or recite their memory work, and bring calm to students and teachers. There were three comfort dogs at the event—Louie and Jackson from Joplin, MO and Jessy from Concordia, MO. After a slide show explaining the ministry and having many questions answered, the guests were invited to pet the dogs and experience the love they gave. Refreshments were served, and a freewill offering was collected for the ministry.